Coy Barefoot is the executive director of the Albemarle Charlottesville Historical Society. He is the former host of several radio shows and currently hosts a weekly program on WPVC. 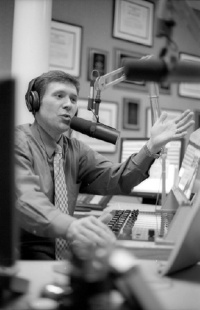 From 2006 to 2013, he hosted Charlottesville Right Now on Newsradio 1070 WINA. He then hosted a program on WCHV. The shows discuss a variety of issues of local and state interest. He is also the former director of Communications and Alumni Relations for the Sorensen Institute for Political Leadership at the University of Virginia. Barefoot is also known for his 2001 book The Corner, which traces the history of student culture at the University of Virginia. ↑ Web. Albemarle Charlottesville Historical Society Announces New Executive Director, Albemarle Charlottesville Historical Society, Press Release, WVIR NBC29, Charlottesville, VA, March 13, 2018, retrieved March 13, 2018. ↑ "Amazon.com: The Corner: A History of Student Life at the University of Virginia (9781574271133): Coy Barefoot: Books." Amazon.com: Online Shopping for Electronics, Apparel, Computers, Books, DVDs & more. Web. 14 Aug. 2009. <http://www.amazon.com/Corner-History-Student-University-Virginia/dp/157427113X/ref=sr_1_7?ie=UTF8&qid=1250279186&sr=8-7>. This page was last edited on 13 March 2018, at 12:40.